Great & Tiny War is the most ambitious show I’ve ever made. Or maybe I’ve said that before?! 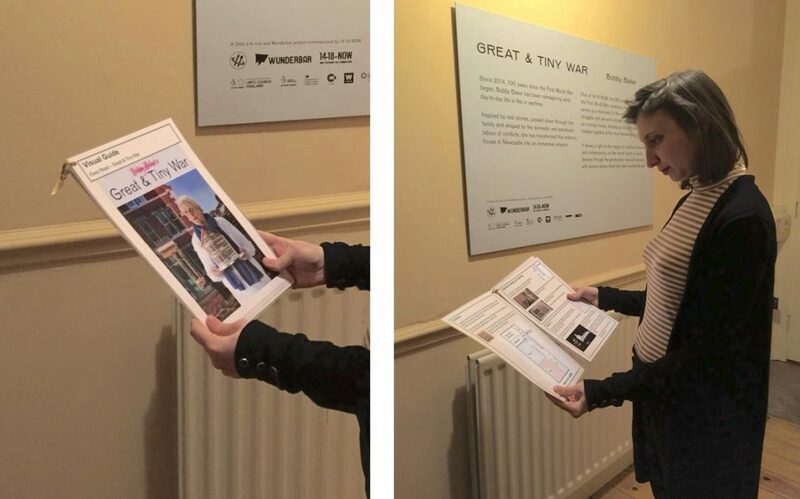 Great & Tiny War takes a whole house and transforms it into a complex art installation where people come in groups of 4 and go on an audio guided tour from room to room with a host. It opened on 9 September and has proved to be so popular that we are keeping it open 3 weeks longer than planned until 28 November. Wunderbar has a long track record of creating great art in unusual places, and we share a passion and belief in doing what we can to reach people where they are, and to make the art as easy as possible for everyone to see. It takes a lot of technical skill to achieve this so having a good team is vital. I’ve worked with Steve Wald, technical director, and Miranda Melville, production designer, for many years – their skill and experience is the reason the dancing peas worked so wonderfully for How To Live. Each of the 5 rooms in Great & Tiny poses complex design and technical challenges. Wunderbar recruited talented local artists and technicians to help install the show and host the tours. Lots of them have been drawn to the project because of what it’s about – transgenerational trauma, feminism and the politics of domestic labour and health care. Many of us have experienced hard times and felt excluded. So it’s been great working together and really fun too. And it’s definitely meant everyone shares a focus on the ethos of fairer access. Inclusion and equality consultant Sarah Pickthall has been part of the team from the start – helping plan and budget the work needed and oversee the brief. And for the first time we used the opportunity now provided by Arts Council Grants for Arts to receive extra funding for extra support for me. A captioned film showing what’s upstairs. The house is on two floors so some people, including older people, can’t see the whole show without some sort of digital package. The film we’ve produced is shown on a tablet in the comfort of the kitchen downstairs. Bespoke visits tailored to your needs, including relaxed and BSL on request. There’s a dedicated page about access at the show here. I’m pretty sure what we’ve set up is rare for a temporary art installation. We know we haven’t been able to do everything but, given our resources, we’ve done our best to make the show as accessible as possible. And the best thing is that we have been able to be responsive to people and the tailoring of bespoke experiences – partly because we have the resources, but mostly because the hosts of the show are so welcoming and ready to adapt. Despite all our planning it’s been much harder than we thought to make this happen due to stuff we just hadn’t anticipated. So, for the record, here’s some top tips I would give myself when (hopefully) working on a massive project again and planning access work. Typically, and considering how complex the installation is, a team of about 10 of us worked right up to the last minute before the first preview to finish. What we hadn’t factored in was the time needed to also produce great quality digital access material. The film, text, images and so much care went into making all this material. I mean, if you’re making a film of part of the show for people who can’t physically get round the installation then as much care needs to go into that as into the art work itself. Filmmaker Alastair Cummings was brilliant . He worked around the crashing and banging of the installation but inevitably finished filming it all after the launch when quiet enveloped the house. So that took an extra week to get working on the tablets. Producing the rest of the digital access work took longer still. Geography was challenging – Great & Tiny War and Wunderbar are in Newcastle, Caroline Dawson, our access specialist from Daily Life Ltd, the sound producer and I are based in London and, after the launch, so was technician Steve Wald. Sarah Pickthall is in Brighton, Alastair is in North Shields. Communication and time and travel cost energy and cash… we hadn’t quite thought through the logistics of all that. Sally Flemons, Wunderbar’s Communications Director, ran a really top class campaign for the project working with SFPPR and the 14-18 NOW team – hence the high audience level. With Sarah Pickthall we had a plan for a special comms campaign to reach new networks – but didn’t make enough allowance for the extra time needed, including finding just the right people to reach. We could have done with local specialist help budgeted in. How do you budget properly? It’s the most important thing surely? We did a pretty good estimate with Sarah Pickthall but what we hadn’t factored in was the extra time it took us all. Film, text, images, recordings, installing it on headsets, testing it required so much care and time. Next time we would budget for another local person on the team to help project manage the making of the access materials, as well as more time for comms. I’ve never tried to work out my own access needs and costs in advance for such a massive amount of work. I’m rather exhausted now with every joint in my creaky body aching. I’m seeing the doctor later today and the physio too, about pain management and recovering from it all. So I think reflecting on what I could have arranged better will take another blog…! But despite all this we are so pleased with what we have achieved given all the challenges. Feedback from audience members has been very encouraging. 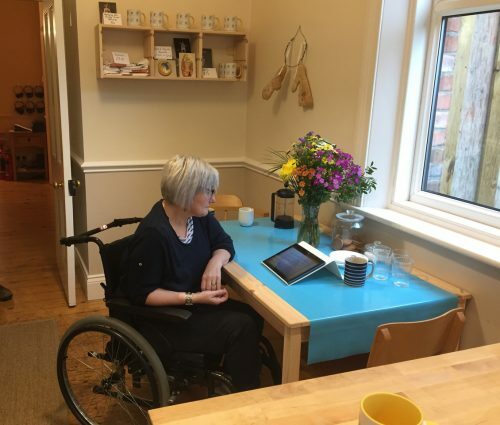 We’ve thought very hard about how we communicate our accessibility offer so as to be really clear (plain English) but not patronising and avoid ‘labelling’ – readers of my last DAO blog will know how I feel about this. People have been getting in touch with bespoke access requests and we’ve been doing what we can to help support these. We are also very keen to listen to feedback and be dynamic in our approach so please do share with us any comments or suggestions. There’s 2 more weeks to see the show… see what you think and let us know! Tickets for Bobby Baker’s Great & Tiny War, an art installation in a house in Newcastle, are available until 28 November.